I wanted to add to the length of my Dewalt and also be able to add hold downs and use other jigs with it. It’s quite short and at times the way it’s made the wood would catch on the fence as it came to the back end of it. I wanted to add a T-slotted extrution to my fence. plus I wanted the fence longer so just bolted it to the out side and now it can be easily taken off. 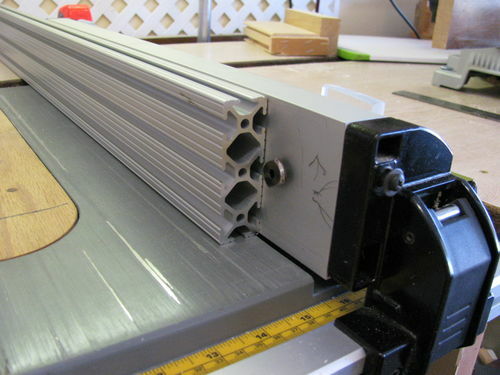 O bought a 48” length of 1”x3” T-Slotted Extrusion off Ebay from 80/20 PLUS for $42 with shipping. One other thing to keep in mind this fence uses a smaller t-nut so keep that in mind if you’re wanting to use Rockler’s t-nut they are bigger. I just happened to have some furniture mounting hard ware that I ground the head down to work, you can see them in the pictures. Note I found some t-nuts at Lowes work great. “curved head screw 1/4-20×2” $.85 if I remember right. Could have got 24” but wasn’t sure exactly what I wanted and the extra will be used for other jigs. Ended up cutting it at 27” so now I can have an extra long fence for cutting full sheets of plywood with no problems. Plus I have one fence that is the exact length of my over all fence to clear that sticky place if it turns out I really don’t like the 27” fence. Now I can slide it up or back and can add T-nuts to make hold downs and the like. I can all so put it up on the higher notch to make the fence 4” tall if need be. One thing to take note of, the stock fence is very thin metal so added a large spacer on the back to put the pressure on the top and bottom of the fence. I didn’t have any scrape aluminum at the time so made it out of plastic. With the 27” fence on the saw I took the left over 21” t-slot and added it to my miter. May be building a better one so just drilled a couple a holes in the old miter wood one and it’s a go. That is awesome. I may have to do the same for my Dewalt saw. since the fence float over the table it really works great. When I was reading up on making the fence some have said to use 2” thick for the fence but with this small a saw it would be way to thick. That sure would be nice on my DW744. Since the table is fairly short, cutting a wide board is less secure than it should be. Nice work, serves the purpose very well. I wrote about the infeed space being a big factor in a saw’s capacity (http://lumberjocks.com/paxorion/blog/46689). I believe your saw, the Dewalt DW745has 5 inches as opposed to 12+. This fence will make a big impact in addressing that shortcoming. On you Tube there is a video concerning the lack of quality of 80/20 extrusions as far as straight and parallel goes. What has been your experience? Would it make a difference if your extrusion were machined for flatness or straightness? 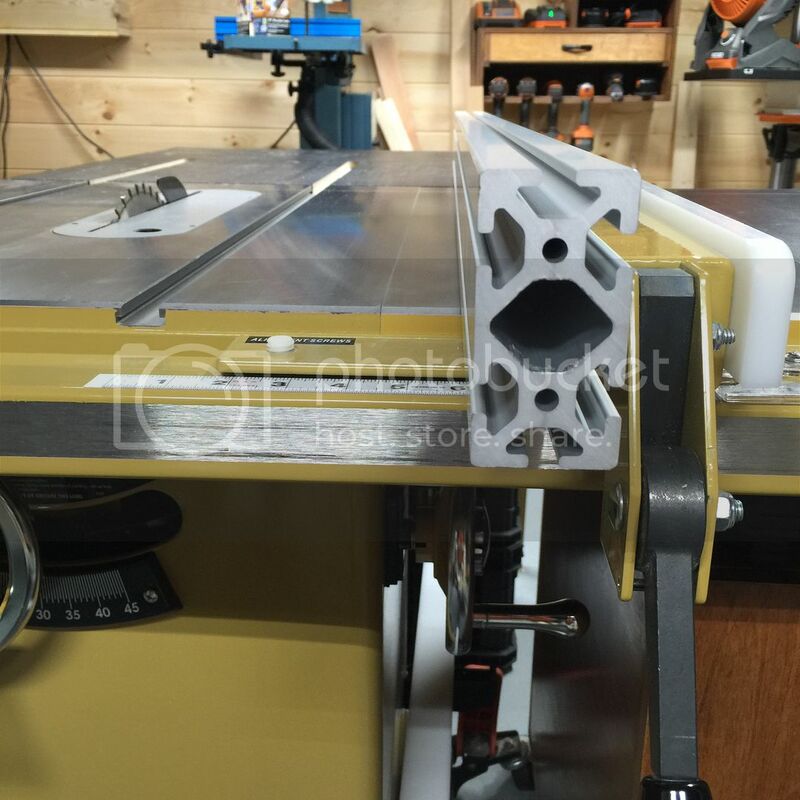 The reason I ask is, I have held-off buying an extrusion for my Powermatic for this reason. Have you indicated the extrusion for TIR? For woodworking I think 80/20, Bosch Rexroth ,or whatever Al extrusion your using is going to be fine in regards to straight/parallel.. 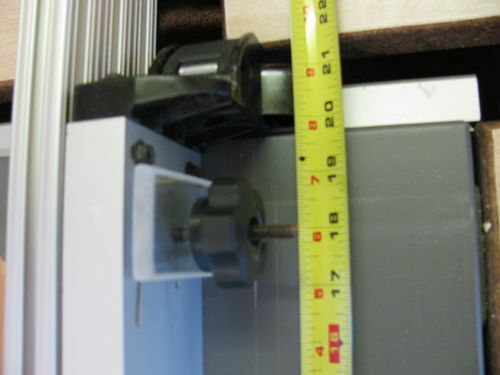 I read some on the difference if your extrusion were machined for flatness or straightness. This is one of those things where some people have to have it perfect, I was going to make one out of oak, would have done the job just as good for my needs but this just kinda adds to the cool factor. I set it on my saw table and it’s as flat as I need it to be, which was near perfect. I would think it’s a lot straighter than the one it replaces. This 1” extrusion is some heavy duty stuff way over kill for this little saw but for the price of less than $16+$12 shipping for a 24” can’t be beat. For $10 more I got the 48” and have some to make other jigs. Once you see this stuff all kind of cool jigs come to mind. I just wanted to add that I said they came from Ebay but it was Amazon. This is where I got mine but there could be better places??? Be sure to check out their nuts and bolts if you want it to be just so. I just happened to have some flat headed furniture bolts that worked. 80/20 is great stuff, but you should be aware that the t-slots are extruded with a slight angle on the face. This way, when the t-nut is tightened, it acts as a lock-washer providing a very secure joint. Take a look at the 80/20 web-site or their catalog for an explanation. I design automated machinery for a living, and use this stuff all the time, mainly for guarding, but also for applications that require less precision. I see no reason that it won’t work very well as a rip fence as long as you keep in mind it’s shortcomings. Extruded aluminum is a great problem solver for so many things. Splinter56 thanks for the insight. psient here’s one place that has the extrusion machined for flatness or straightness? There may be others I haven’t looked in to the bigger sizes. Your going to pay more but it will be right!!! 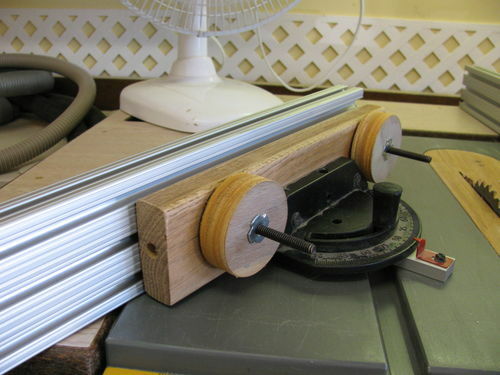 Yesterday I made a tread making jig for my toy wheels. 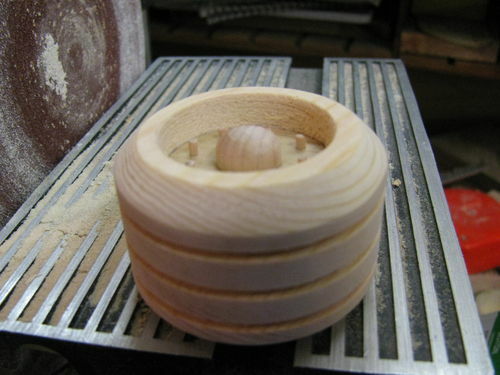 I first made it for the router thinking it would make nice tread but turns out it would take to much sanding sooo. I took the same jig drilled two holes added bolted and slid it on to the fence and wala. 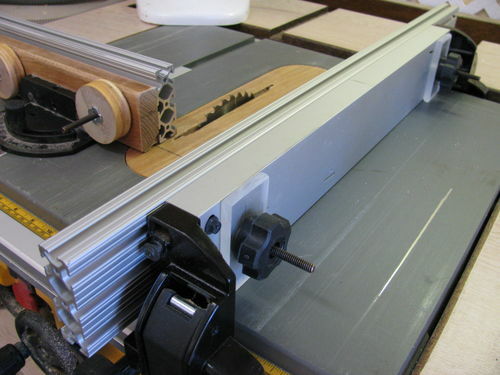 The table saw cuts much cleaner treads, quieter and safer. Just center the blade with the jig and your all set. 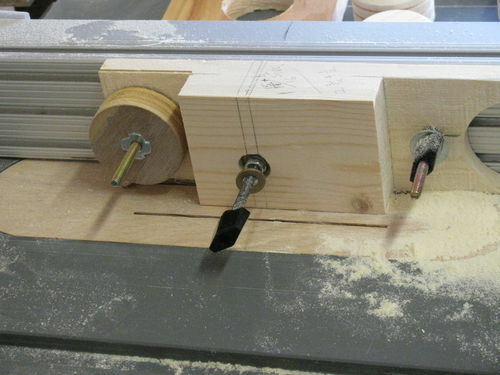 I now place a wheel blank on the bolt, bolt it up lossly and turn on the saw while holding the wheel, then crank up the blade and turn the wheel. You’re only raising the blade 1/4” or so so no problems turning it by hand. I know the jig ain’t pretty but wasn’t planing on showing it off till now. Going on 4+ months how are you liking the fence? 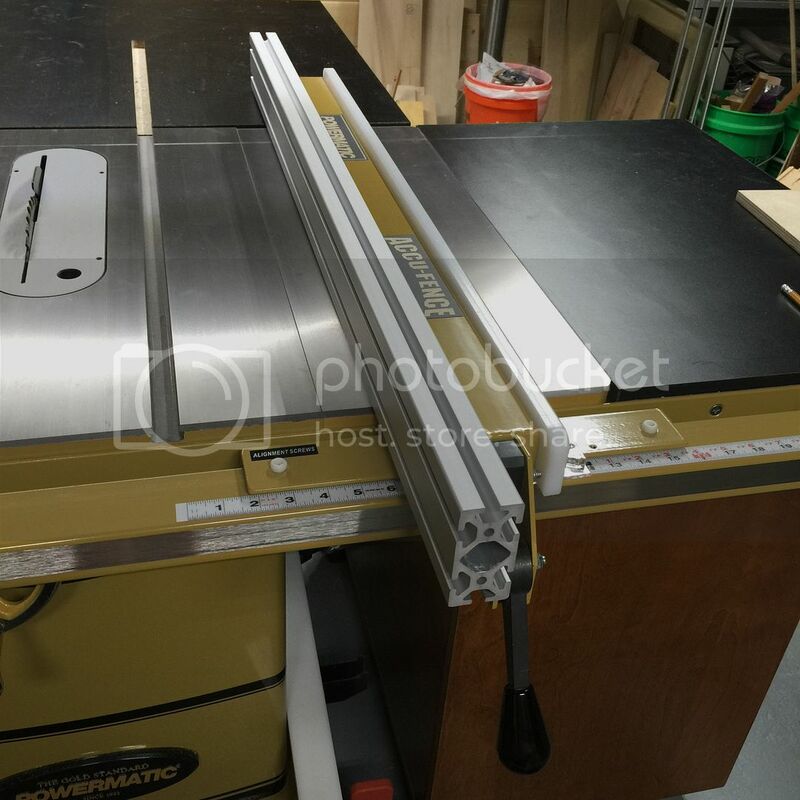 I just got a DW745 table saw, and noticed the stock fence has fairly thin aluminum walls, and with a dial indicator showed a bit of waviness, about 0.02” max, though front and back are closer than that, so it dips in the middle. I was searching for ideas and came across this post, and this seems like it might be a good approach to giving a flatter, longer, and sturdier fence. Also, have you noticed the miter slots aren’t all that uniform? 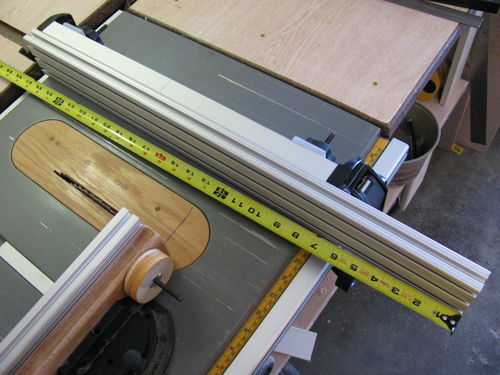 I’m making a crosscut sled with an Incra slider, and there are several places where it binds, and if I loosen the adjustment screws then I feel like there is too much play, though I’m not experienced enough to know how much play is acceptable. One more thing, I’d like to make a zero-clearance insert. Is your’s as straight forward to make as it appears? 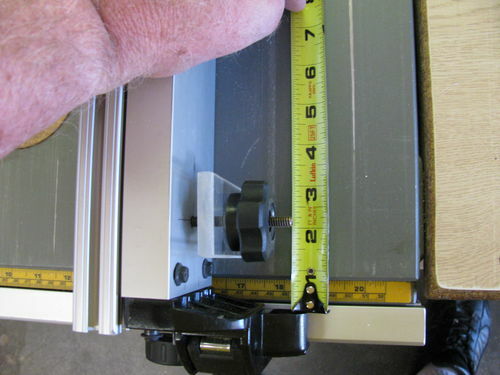 As a new, inexperienced table saw user, I’d really like to keep the riving knife and blade guard in place whenever possible, though that would be very challenging if not impossible since you’d have to cut through the end of the insert completely. Thanks, and good work on that wheel jig! Sorry joshtp I missed your post and just now found it. I really like the fence but have got to where I just use it when I feel I need the longer fence. I build models with a lot of very small parts and the fence has a indent at the bottom that lets very thin stock get under it so this slows the use of the fence. I just thought that I could saw it down, we’ll see. On the riving do a search for plastic rive inserts or make wood ones. 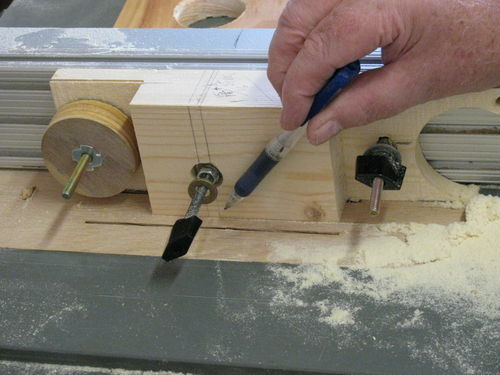 Extend the saw blade cut and glue in some wood to do the riving. Great job! You had the same idea as me haha. I attached a machined extrusion to my fence also.